One of South Africa’s most celebrated long-distance swimmers and veteran of 108 Robben Island swims passed away on October 17, at just 60 years leaving Cape Town swimming community reeling in immense sadness. Theodore’s swimming journey started in his twenties against the backdrop of a provincial swimming and water polo career. After finishing his studies, he decided to follow in the footsteps of his older brother, who had already done a few Robben Island swims. 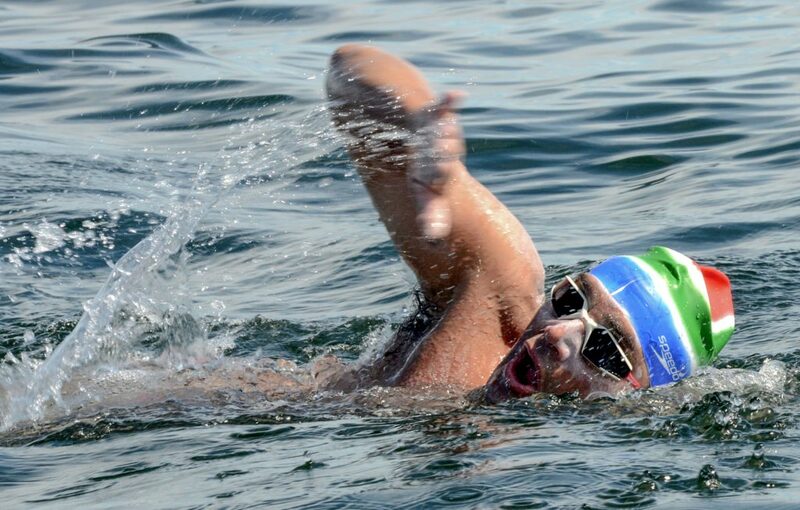 He was a veteran of 108 Robben Island swims, an English Channel swim and many other international distance swims. In 2016 Theo held the title as the 1st person to ever undertake the Robben Island crossing 100 times. His inspiration was drawn from American swimmer Lynne Cox and British long-distance swimmer Alison Streeter. Cox swam the Bering Strait in 1987 and Streeter had done the most swims across the English Channel. Locally, he admired Lewis Pugh, Peter Bales (retired chairperson of the Cape Long Distance Swimming Association) and Otto Thaning. In 2015 Thaning became the oldest person, at the age of 73, to swim the English Channel. In 1996 Yach triumphantly completed the English Channel crossing to France on a second attempt. 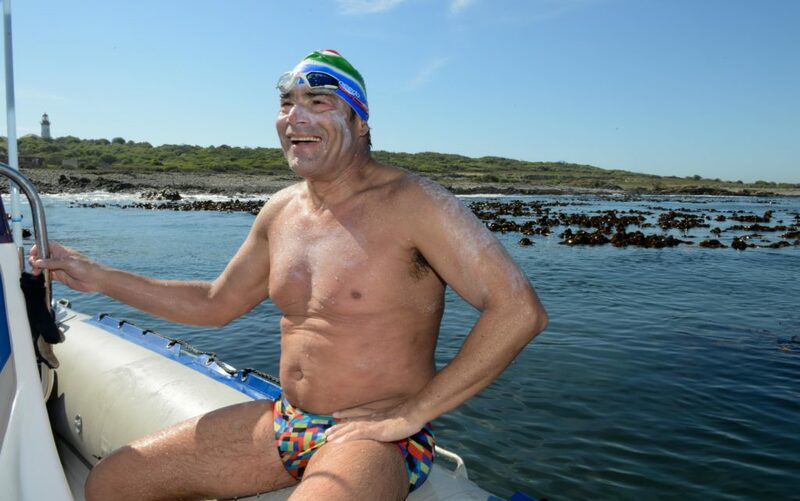 Theodore was more than a champion swimmer, he used his talent to raise R6.5million for charities in his 35 years of swimming in the Cape’s icy water. He was a well-respected businessman working as the Cape divisional head at Zenprop and also the founder of the Cape Town Partnership – an R25billion rejuvenation project in the city’s CBD. An old school friend from Wynberg Boys shared this with Amanzi: “My boarding school prefect and tremendous role model……..Theo will leave a massive void in most people’s lives. He would always make contact to congratulate me on my achievements as we shared a lot of mutual respect for the work we do and yet, it was always him who achieved so much more. Someone who wasn’t selfish and often put others ahead of himself.” said Brad Bing from Sporting Chance. 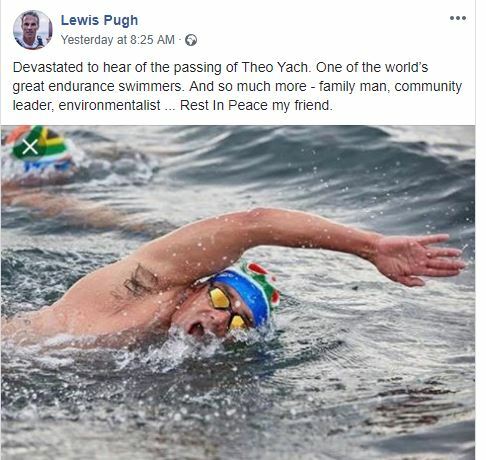 There was a call from the broader Cape Town community to formally honour Theo by renaming the annual Robben Island to Cape Town race, one of the world’s toughest open water events, “The Theodore Yach Challenge”. Cape Premier @HelenZille issued a statement supporting this call. Theo has left a lasting legacy through his contributions to swimming, to charity and to aspiring young swimmers. Our sincere condolences to his wife Michelle, his two sons, Daniel and David, family and friends.